The PowerBase is both a vibration cancelling and power cleaning isolation base for equipment. 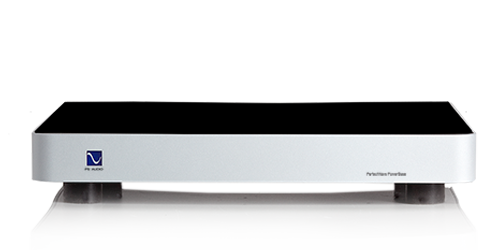 Set any audio or video product on top of the PowerBase and enjoy cleaner more dynamic sound or video as a result. Vibration cancelling and power cleaning in one convenient package. Holds up to 85 pounds, accepts up to two units. The PowerBase has been discontinued by PS Audio and is no longer available to order. The PerfectWave PowerBase combines a dual diffused isolation base with a one-way-gate power conditioner into an elegant, component level product base. Use the PowerBase for source, control or power equipment and enjoy a remarkable improvement in the space between instruments, vocals and soundstage. Lowers the smearing and grunge associated with microphonics of equipment, especially tube, turntables, CD players and source gear. Helps any product reach its full potential with cleaner power and lower induced noise from your loudspeakers. "The PowerBase improves dimensionality, dynamics and enhances timbral realism, without altering the frequency response. - These PowerBases will not leave my stereo system." "Clean looks, and a cleaner sound, the PowerBase is a unique product that warrants auditioning if you are trying to eke out the best performance from your components. Definitely recommended." further refinements to the sound from my system,"
PowerBases are available with either US receptacles, as shown, or a female IEC connector that can work in any country around the world. Contact us with any questions.